New York, N.Y. — The Environmental Justice Health Alliance, Clean Water Action, and Natural Resources Defense Council today filed a lawsuit against the Environmental Protection Agency for its failure to pass regulations requiring the most dangerous chemical facilities to develop plans to prevent and respond to worst-case scenario spills of hazardous substances, including spills triggered by natural disasters that put people’s health at risk. Congress mandated such regulations in 1990—but more than 25 years later, EPA has failed to act. “From Hurricane Katrina to Hurricane Harvey, we've repeatedly witnessed communities inundated by toxic flood waters—laced with an unknown concoction of hazardous chemical substances. These preventable toxic chemical exposures add an insidious threat of long-term health problems to the near-term heartbreak of natural disasters. Black, Brown, and poor communities are more likely to be impacted by chemical spills and suffer the health impacts of pollution, so EPA's nearly 30-year delay has allowed some of our most disadvantaged communities to suffer toxic pollution right when they're most vulnerable,” said Michele Roberts, National Co-Coordinator of the Environmental Justice Health Alliance (EJHA). "Climate change is increasingly bringing chemical disaster to our doorsteps. Rising sea levels and a dramatic increase in major flooding events are overwhelming unprepared chemical facilities and washing toxic substances into the homes of nearby communities. Communities of color and low-income families have always faced a disproportionate burden of toxic floodwaters and chemical spills, but this is a burden no community deserves. Congress was wise to require EPA to establish rules to prevent worst-case scenario toxic chemical spills almost 30 years ago, and it would be wise for EPA to finally take action to protect our families,” said Jose Bravo, Executive Director of the Just Transition Alliance, an EJHA affiliated organization. Alleging violations of the Clean Water Act, the complaint was filed in the Southern District of New York and seeks to force EPA to promptly issue rules requiring robust spill-prevention and response planning for the most dangerous onshore chemical facilities—which, because of their proximity to water, could cause substantial harm to the environment and human health. “Congress required EPA to develop regulations to address hazardous substance spills and leaks into water nearly 30 years ago. The agency's failure to act ignores Congress' intent and puts drinking water sources and communities at risk,” said Lynn Thorp, Clean Water Action’s National Campaigns Director. Facilities producing and storing hazardous substances—including known human carcinogens—are disproportionately located in or adjacent to communities of color and low-income communities. As a result, the risks and consequences of preventable hazardous substance spills, which can contaminate waterways and harm public health, are disproportionately borne by these same fenceline communities. “For over 25 years, EPA has abdicated its responsibility under the law to protect communities that live near aboveground storage tanks brimming with harmful chemicals. These communities live with the constant risk of experiencing catastrophic, toxic chemical spills in their own backyards. This lawsuit seeks to put critical protections in place once and for all,” said Kaitlin Morrison, Attorney for the Natural Resources Defense Council (NRDC). EPA’s failure to establish worst-case scenario spill planning regulations for onshore facilities like aboveground tanks storing hazardous substances has left a substantial gap in environmental and public health protections from chemical spills. An estimated 2,500 U.S. chemical facilities located in flood-prone areas nationwide are subject only to state-level spill-planning requirements—which, if they exist at all, are vulnerable to rollback at any time. 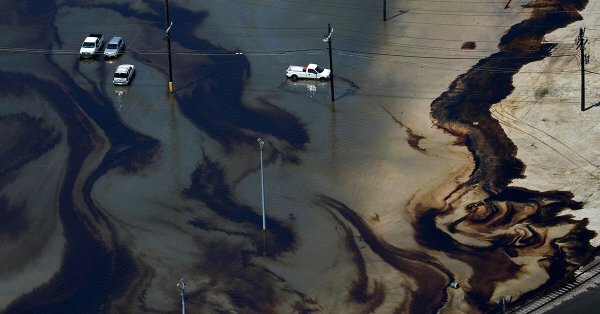 Hurricane Harvey highlighted this glaring regulatory gap—despite Houston’s density of chemical facilities and susceptibility to severe flooding, Texas does not require facilities storing hazardous substances to develop specific plans for how to prevent and respond to worst-case scenario spills, including those caused by storms and natural disasters. In the wake of Hurricane Harvey, numerous facilities released harmful chemicals through spills, leaks and explosions, causing some first responders to be hospitalized. Had worst-case scenario spill plans been in place at those facilities many of these injuries might have been avoided. Ensuring that EPA fully complies with its duty to issue spill-prevention and response regulations will reduce the risk of harm to the communities who live closest to these facilities and help address the long-standing societal imbalance in the burdens that chemical production and storage impose on fenceline communities. EJHA recently documented how the risk from chemical disasters is just one of the many disproportionate burdens that environmental justice communities face on a daily basis in its report, Life at the Fenceline: Understanding Cumulative Health Hazards in Environmental Justice Communities.